Located in the business and leisure district of Hai Phong city and only a short drive to the Hai Phong airport and Do Son beach destination. A busy, yet historic and green surrounding amidst a lake, park and traditional shopping areas make the Nam Cuong Hotel - Hai Phong an ideal place to stay. Other close by city sites include, the football stadium, the culture and exhibition centre, children's park and the university belt. All rooms are well appointed and fitted out with modern day amenities the discerning business and leisure traveller is expecting, coupled with the traditional Asian hospitality of friendly smiles. Nam Cuong Hotel – Hai Phong opened on October of 1998 with firstly named as Tray Hotel. Over than 10 years operating, the Tray Hotel affirms the trade name in tourist market of Haiphong city. 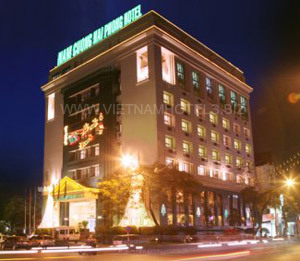 As the intention of long-term development on the field of Trade – Tourist – Hotel of Nam Cuong Group, from the 1st of January, 2009, the Tray Hotel was formally renamed as Nam Cuong Hotel – Hai Phong. Along with Nam Cuong Hotel - Hai Duong, Nam Cuong Hotel – Hong Bang and some hotels which will be opened in nearly time, as: Nam Cuong Hotel – Nam Dinh, Hotels and Office Tower in Duong Noi urban (Ha Noi)... Nam Cuong Hotel – Hai Phong are leaded by Hotel and Tourist system of Nam Cuong group – the group was developed from Nam Cuong Tourist and Trade Co., Ltd., new urban construction and investment, Tourist – Trade – Hospitality enterprise.